Try not to get mad at us, Apple fans, but we’ve ditched our AirPods. Don’t get us wrong, we love the idea of them and the design is fantastic for the most part. But they’re made out of slippery plastic which means it’s impossible to get them to isolate sound, and bass suffers tremendously as a result. We’ve been using the VAVA MOOV 25 Bluetooth Headphones (just $26 with coupon code CARB5CTZ), but they’re not cord-free wireless earbuds like Apple’s AirPods. If you want truly wireless earbuds with silicone tips that won’t constantly slide like AirPods, check out the three recommendations below. 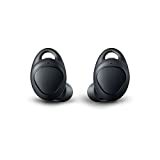 TRULY MINI WIRELESS EARBUDS− TWS technology makes wireless synchronous connection stereo pairing come true. 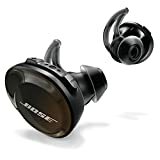 Eliminate stethoscope effect of all wired headphones and noise reducing. Ergonomic design, secure fit, provide long time comfortable wearing. 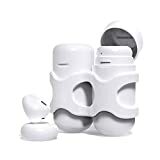 QUICK CHARGE CHARGING BOX−Portable charging case is also a battery.It is lightweight with large capacity lithium battery,which can support 4 times charging for the earbuds and let you enjoy more than 3 hours music or talking time after each single charge.